Lightweight, agile and powerful, the Aprilia SL750 SHIVER is driven by a brand new 90° V twin engine with four valves per cylinder. Putting out 95 HP at 9,000 rpm, this extremely compact unit delivers similar power to an equivalent four cylinder engine, while maintaining all the benefits of a twin in terms of torque (81 Nm at 7,000 rpm) and riding pleasure. These extraordinary results have been achieved in part by the fact that the new SHIVER is the first production motorcycle in the world to use ride-by-wire electronic throttle control to optimize throttle valve aperture on the basis of a range of parameters including engine speed, gear selection, throttle grip position and movement speed, temperature and atmospheric pressure. The new system guarantees consistently exceptional performance in top-end acceleration and low-end pickup, with smooth, effortless, low rev torque and reduced fuel consumption. The result is a smoother, more satisfying ride and unrivalled performance on the open road. 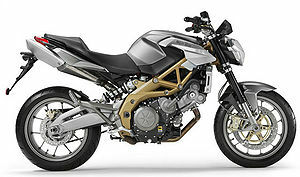 The APRILIA SHIVER’s new 750cc V twin is also the first Aprilia road-going motorcycle engine to be designed, developed and manufactured entirely within the group, in keeping with the same strategy for technological innovation that has already seen the launch of Aprilia’s 450 and 550 cc off road twins. As Aprilia tradition demands, the SHIVER’S chassis is simply unique in this class of motorcycle. The innovative, mixed trellis and aluminium frame delivers standard-setting rigidity to guarantee safety and precision control in the hands of inexperienced riders as well as experts. Thanks in part to this amazing frame, the new SHIVER weighs in at only 189 kg. The braking system is impressive too. The SHIVER boasts the same, generous 320 mm front discs as Aprilia’s flagship models RSV 1000 and Tuono 1000 R.
It is certainly no easy matter to take the lead in a class as fiercely competitive as the medium powered naked class. A class where the battle is not just about technology and performance, but also design, economy of use and riding ease and pleasure, elements which are not always compatible and are particularly demanding for designers and engineers. The pride of all Aprilia bikes, refined mechanics and a top class chassis, are once again the key to the success of the 750 V2. 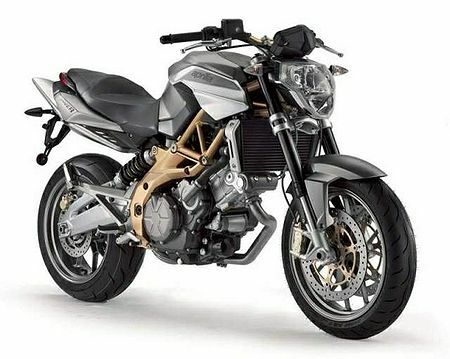 The Aprilia SL 750 Shiver is the naked everyone was waiting for. 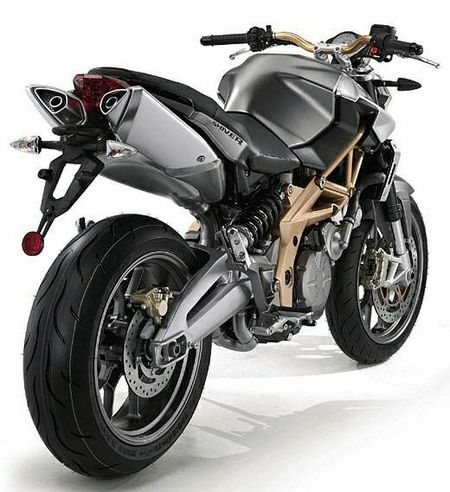 A design able to satisfy the disparate needs of those buying this type of bike. From everyday use to a trip along mountain passes or use on the racetrack, the Aprilia SL 750 Shiver is completely at home in any situation, guaranteeing pure riding pleasure at all times. Light, agile and powerful, it has a new generation engine and the most advanced technical features in its class. The brand new 90° V2 produced entirely in-house by Aprilia is extremely compact. Above all, thanks to the advanced electronic management, it can deliver power comparable to four cylinder engines in the same class, but with much more favourable torque at low revs for an efficient and pleasing ride even on everyday routes. True to the Aprilia tradition, the chassis simply has no rivals in its class. The innovative mixed trellis/aluminium frame provides standard setting rigidity. All this makes the bike extremely compact, perfect even for the beginner. With a dry weight of just 189 kg, the lightness of the Aprilia SL 750 Shiver also satisfies the most canny motorcyclist, thanks to its manoeuvrability and engine performance a bike able to accompany its owner from his first few metres on two wheels up to his complete motorcycling maturity. Frame Dismountable steel trellis connected with high strength bolts to aluminium side plates. Dismountable rear frame. Rear Suspension Aluminium alloy swingarm with reinforcement truss. Hydraulic shock absorber adjustable in spring preload and rebound damping. 130mm Wheel travel. This page was last edited on 1 February 2011, at 21:27.